Jackie (not her real name) came to me with depression. She had been on Welbutrin for 4 years and wanted to stop it. Every time she started cutting back on it, though, she would become despondent. She had tried different things including 5-HTP and L-Tryptophan but to no avail. She had seasonal allergies too. I put her on a supplement regimen based on the Walsh Protocol. She was able to stop the Welbutrin. Her seasonal allergies stopped too. According to the Walsh Protocol, Jackie was undermethylated. Methylation therapy helped her balance her methylation issues. 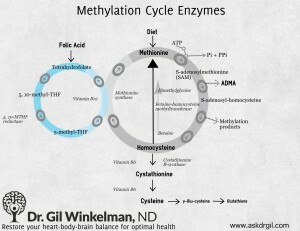 What is methylation? How do you know if you are undermethylated? And how do you balance out the issue? Undermethylation is one of the subtypes described by William Walsh in the Walsh Protocol. The Walsh Protocol treats different conditions. According to the theory, anxiety, depression, schizophrenia, ADD, and behavior issues have different subtypes. In mainstream medicine, each diagnosis is seen monolithically. In other words, if you have the diagnosis, there is no difference in treatment. The Walsh protocol looks at it differently. The diagnosis is less important as the physiological subtype. Treatment starts by understanding what is out of balance biochemically. Each subtype has a different biochemical signature that testing can determine. To understand under-methyation, one must understand something about genetics first. It directs our testing and understanding of how to treat the condition. To do this, we must understand epigenetics, histamine, and some basic chemistry. To begin, I think it is important to explain what a methyl group is. A methyl group is a small hydrocarbon. There’s one carbon attached to three hydrogens. This allows one space for this molecule to attach to something else. This attachment allows the methyl group to act as a messenger. Our bodies have thousands of these types of molecules that act in this manner. Every cell attaches and removes millions of methyl groups every second. Each attachment has a different meaning and message for the cell. The exact mechanism we don’t understand. 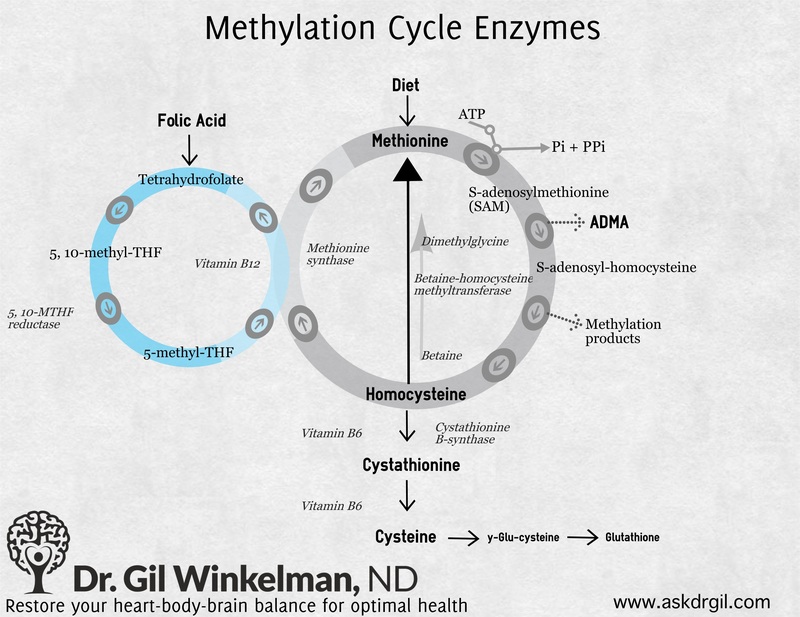 The methylation cycle in cells is crucial to many processes in the body. The diagram below shows part of the pathways related to methylation. Looking at the diagram you can see that there are in effect two circles. Each of those sets of reactions cycle millions of times per second. Methyl groups get kicked out with each pass and then shuttled to where needed. If there is a disruption on the right side, methyl may stop producing. A disruption on the left side can create too much methyl. As you can see from the diagram, heavy metals can interfere with both processes. You can also see how different vitamins and minerals such as folate, B12, magnesium and B6 are important to this process. Now that we understand what a methyl group is, let’s explore epigenetics. Epigenetics is the science of understanding how DNA turns on and off. Our DNA is more of a template than a blueprint. There are different instructions that are turned on in many ways. Methylation – the attachment of methyl groups to the DNA – is a mechanism of epigenetics. A methyl group attached to one region of DNA might turn off a gene. This is how our body adapts to different environmental events. Let me give an analogy to explain. Let’s say that we took all the train track in the United States and wanted to put into a 10 by 10 room. Yes I know this is impossible but bear with me. How would you do it? You’d need to wind the track up into tight balls to do so. You’d spool like thread. Let’s say you wanted to take the train from Portland to Seattle. You would have to unwind the train track and then put the train on it and then wind the track back up as the train goes by. I go back and forth from Seattle a fair amount so in this scenario it would make sense for me to bookmark that location in the track. This makes it easier to find each time. This is how DNA works in the cell. It is wound up tightly around proteins called histones. Methyl and acetyl groups attached to the histones as a sort of bookmark system. This makes it so that the cells turn those genes on more easily. Epigenetics explains nature versus nurture. The DNA has tendencies towards certain expressions. But it can adapt to different events. What we eat, what we breathe, what we experience, all change how our DNA turns on and off. Methylation is one way that we can measure our epigenetic function. Epigenetics may explain how people react differently to the same event. For example, why do two different soldiers who experience the same trauma have different responses to that trauma? This is beyond the scope of this article but it is important to note that not all people are traumatized by traumatic events. There are tests that exist that can measure the DNA directly. 23 and Me is one of these tests. These tests can measure point mutations in the DNA called a single nucleotide polymorphism or SNPs. For some genes these mutations are critical. For others, it is not known what the impact to one’s health is. Smaller proteins are more likely to create bigger problems than larger ones. MTHFR is an important gene with regards to methylation. There are several SNP variants that exist, but a variation may or may not express as expected. Many of my patients with an MTHFR defect should show up as being overmethylated. But at least half are undermethylated. Until we understand more about the interaction between the DNA code and the expression, it is likely a less useful test. Recently, a study from Australia concluded that there was no evidence linking mental illness to the MTHFR SNP. It’s just not an accurate way to predict genetic function. How do I Know I am Undermethylated? Methylation is difficult to measure. There are few tests that are accurate. I use the histamine determination test to find methylation state. Most people think about histamine in relation to allergies. 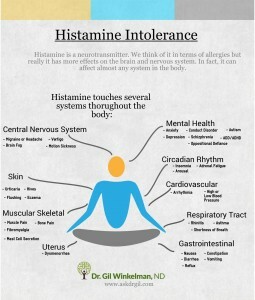 Histamine is actually a neurotransmitter. As you can see from the graphic below, histamine affects many different systems in the body. Histamine and methylation are inversely related. As methylation goes down, histamine goes up. As methylation goes up, histamine comes down. This relationship allows us to indirectly measure methylation. The challenge to measureing is that so many medications affect histamine. In Jackie’s case, we couldn’t get an accurate read on her histamine levels. Welbutrin is an anti-histamine. Her blood levels of histamine appeared normal. As I’m trained in the Walsh Protocol, I knew the safe manner to treat presumptively. Another test that is sometimes used is the Doctor’s Data Methylation Panel. This test is great for finding out if someone is undermethylated. If someone is overmethylated, though, it may give a false negative. 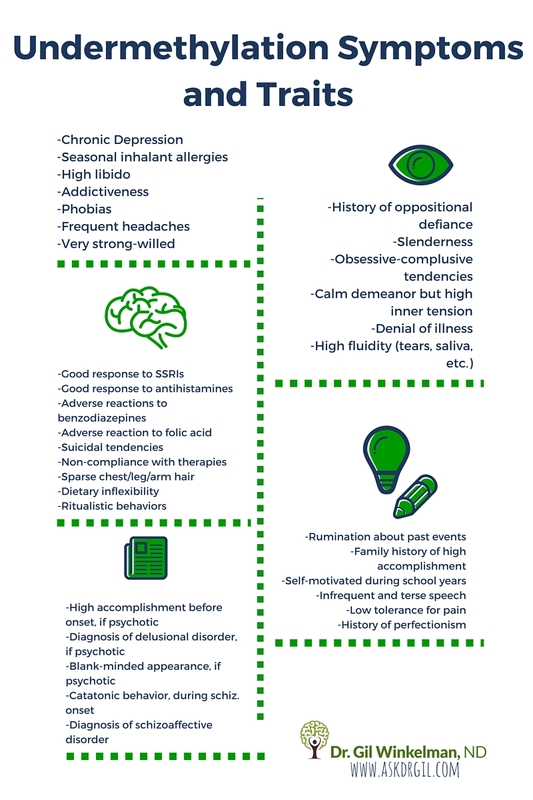 The diagram below shows a list of symptoms that we see with patients who are undermethylated. In general, these people are more perfectionistic and do well in school. They may be obsessive with compulsive tendencies. They are competitive and strong-willed. 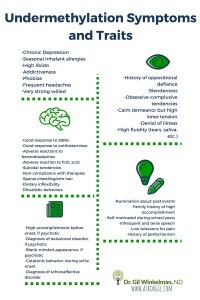 Most autistic people are undermethylated though not all. One of my first patients with autism had extremely severe seasonal allergies. Typical naturopathic treatments didn’t help. Treatment of the undermethylation helped relieve her seasonal allergies and more challenging autistic behaviors. What does Methylation Therapy Look Like? Undermethylation or histadelia (high histamine) requires bringing methyl levels up. When I first started learning about the Walsh Protocol, I thought that giving methyl-folate and methyl B-12 was the appropriate treatment. Since then I’ve learned that isn’t the appropriate choice. Methyl-folate does donate methyl. But folate in general is a methyl stealer. It removes methyl groups from DNA. (Look back at the diagram too. Folate removes methyl from the system on the left side. ) Vitamin B-12 isn’t a particularly strong methyl donor. The exception to not taking folate is if you are pregnant. In that situation you should take folate along with the recommendations here. In general, I recommend L-Methionine and/or SAM-e for my patients who are undermethylated. A higher L-methionine dosage is required than SAM-e. Patients also improve with zinc, vitamin C, Calcium/Magnesium, and Vitamin B-6. Inositol sometimes helps with sleep problems. Treatment can take months before an improvement is noted though. You might have a better idea why Jackie improved with this treatment. She was undermethylated. Because methylation and histamine are inversely related, her histamine was high. Welbutrin helped reduce histamine but didn’t help her methylation status. Methylation therapy using the Walsh Protocol helped reduce her histamine. She found herself able to come off of Welbutrin. Methylation therapy can be exceedingly helpful for many patients. The key is to know your status of methylation, copper, zinc, and other markers. A qualified clinician can help by knowing the appropriate tests and how to look at the big picture. Rarely, is there one problem in isolation. Let me help you or your loved one with their mental/emotional issues. Schedule today to start the journey towards greater health.